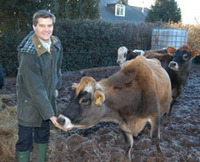 This from the Western Daily Press: "Tory stalwart Ann Widdecombe has joined the battle to prevent the slaughter of a West pet cow suspected of being contaminated with BSE.The Conservative MP for Maidstone has become the second MP to join the campaign to save Jersey cow Harriet from slaughter. Harriet, whose cause is also backed by Tory MP for the Forest of Dean Mark Harper, allegedly shared feed with an animal that went on to contract Mad Cow Disease. But straight-talking Miss Widdecombe said that was not a good enough reason to cull her. She said: "I am not silly and sentimental - if an animal is contaminated then it should be prevented from entering the food chain. But it seems to me that there has been quite a lot of conflict of interest. If she will never enter the food chain then it seems reasonable to keep her alive." See more on Mark Harper's website. CH going for the John Craven animal story award? Which one is Widders in the picture? It is nearly Christmas Valedictoryan and Charlotte's Web will soon be in the cinemas... I'm just getting seasonal! You don't mess around with BSE. A completely irresponsible stance from an animal rights activist. Ann isn't an "animal rights activist" but a very compassionate woman. She is a personal friends of mine and although there are a number of issues on which we disagree - notably fox hunting - I respect her views. The issue of BSE almost ruined our farming industry, and many livlihoods with it. We have strict safeguards in place, not only to ensure the publics safetry, but also to reassure the public, and our export market that there is no way BSE could get into the food chain. It is really reckless for a well intentioned MP to interfere in this way. The future of our farming indystry is far more important than one cow. Am I right in thinking Tony Blair made the same mistake during the foot and mouth outbreak by being concerned about the fate of one single animal? Kill the thing in the interests of public health. If I ever had any doubt that Ann Widdecombe had completely lost the plot then this confirms it. This is the sort of good, soft centred local campaign, that gets people elected and keeps them elected. It needs to be backed up with serious politics elsewhere - but it is the sort of thing that makes people give you the time to talk about more serious politics. There is no public health issue, as far as I can see, if the animal doesn't enter the food chain - so why shouldn't we advocate minimal state intervention here! Prentiz is right. More constituents will remember Mark Harper for this (and fondly) than most other things he'll do as their MP. Prentiz and Umbrella Man are correct unfortunately. I'd happily kill the blasted animal, but doing the 'ahhhhh-look-at-the-cute-fluffy-bunny' thing wins votes. Yes, get on with it, have a campaign and save the damn thing. I seem to recall reading that Phoenix The Calf on the front page of every national newspaper was lamb chops a year later. I'm sure this thing will make a lovely photo opportunity but I bet it's in a kebab by March. Well it doesnt win my vote, and only helps to dum down politics. MPs have a duty to elevate things, not appeal to the lowest common denominator. But my point is this,if in this day and age this kind of crap is what you have to do, is it any wonder that the brightest and the best look elsewhere? "is it any wonder that the brightest and the best look elsewhere?" Your earlier point about Goldman Sachs bankers was apparently meant seriously! Wow. No, I would echo the comment from 'Wellness' about Goldman Sachs bankers apparently having to dumb down to this awful and embarassing level. Is this really what we want our MP's to be focussed on, valedictoryan? The editor's headline suggested that the story was about Ms Harman - LOL! The wow is that you'd put Goldman Sachs bankers on a pedestal. No pedestal from me for Goldman Sachs or any other financiers. It's just that I would prefer an MP with banking experience running, say, for the sake of a silly argument, the Treasury maybe - rather than someone like Ed Balls. A CV based around writing for the FT doesn't inspire me with the same sort of confidence oddly. I'd feel safer if he was Minister For Cow Saving. what do we have...2 MP's sodding about with a cow. This shows how society has moved on - under the our previous administration that was likely to have been a headline splash on the front of the News of The World! Sorry, can't resist teasing - it's a pretty impressive breed of cow that can produce beef and lamb! I think we should save Harriet, and use her as a mascot for a "where our food comes from" educational campaign! Yes Richard you are right. I seemed to recall some mud-splattered thing on the front page of the Telegraph being a lamb-cutlet-sort-of-object. Obviously I will fail in the Animal Observation And Memory Retention round of this week's pub quiz. Very true observation about the NoTW. The analogy with bankers is rather ironic - before Mark entered politics he was a successful finance analyst and owned his own accountancy practice. I'm fairly sure anyone wanting to go into politics themselves would judge Mr Harper on the way in which he has handled his subsequent brief as a junior defence minister - a quick scan of his parliamentary activity shows he's spent vast amounts of time raising the profile of unfashionale issues like veteran's welfare, for which he should be congratulated. This story is an excellent example of a hard-working MP using a good local story to highlight the issue of ridiculous over-management by the Labour government; Harriet simply does not pose a public health risk, and all her death would mean would be a box successfully ticked somewhere in Whitehall. He's simultaneously helping out his constituents and a local level and underlining Labour's failures on a national scale. Any would-be MP should be suitably impressed.